Despite the dreary rain outside, customers find their way into the warm, newly opened restaurant at 2380 Esplanade Dr. in Algonquin: workers on lunch break; ladies out shopping. One of them, however, Ellie Sudduth of Huntley, has come specifically to eat at The Village Vintner Winery & Brewery. “I saw their booth at the Woodstock Farmers Market, and I decided to come in and see what it’s all about,” says Sudduth. Taking a seat at the huge granite-topped horseshoe bar, she consults with bartender Jill Annen about what’s good, settling on the wood-fired chicken sandwich, served with hand-cut sweet potato fries and homemade coleslaw. Shortly, Annen returns from the kitchen with a small cup and fork. The new restaurant is the collaborative effort of Steve and Bob Boyer. Steve operated his custom wine shop just a few miles away, on Randall Road in Carpentersville, for six years, the very successful extension of a hobby begun in his basement. Turns out, he was also brewing great beer down there. 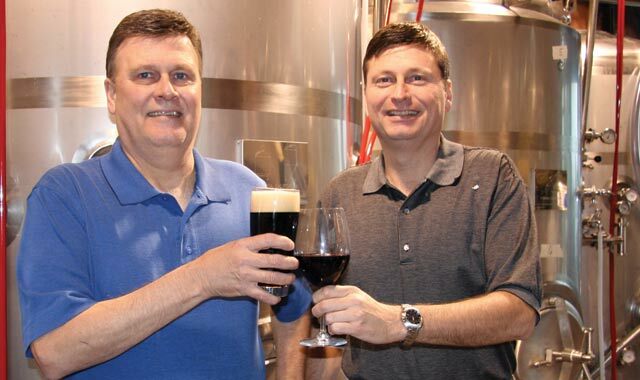 Now, he and brother Bob, who previously ran a restaurant with another brother in Libertyville, are bringing together great wine, tasty brews and fantastic food under one roof. The brothers designed the layout and constructed a good deal of it themselves. A focal point is the large brick wood-burning stove, for cooking homemade pizza, ribs and brisket. It’s open to public view and tucked into a corner, its bright white stucco finish a vibrant contrast to the brick walls behind it and stamped tin ceiling above. Other appetizers: fire-roasted brie, a mussel mixer and a Portobello flatbread. Along with build-your-own pizzas, standard offerings are anything but: pesto and asparagus, steak and blue cheese, cashew and pear (port-poached pear, caramelized cashews, goat cheese, ricotta with arugula tossed in raspberry vinaigrette). The South West burger is topped with jalapeno pickle chips, wood-roasted corn salsa, avocado and cheese. “Our turkey burger is fantastic, and people love the fire-roasted beef brisket panini,” says Bob. Entrees include Western Mac, with cavatapia pasta, a cheesy Merkts ale sauce, beef brisket, jalapenos, roasted red pepper and baked with cheddar cheese. Other customer favorites include the wood-fired filet, the cedar-planked salmon and the Eggplant Caprese – grilled eggplant topped with fresh mozzarella and basil, drizzled with tomato sauce and served over fresh linguine pasta. The restaurant and bar seat 100; a patio is open in good weather. Toward the back is the tasting bar, set up in front of the glass-enclosed brew vats. Fruit wines augment the selection of grape vintages. Beer tastings are also offered, of course, and the drink menu includes signature martinis and mojitos. The Wine & Mug Club provides upgrades on drink sizes, special pricing on wines of the month, discounts on take-home beverage purchases, a growler club for beer drinkers and more. “We’ll carry six of our own beers on draft, with two of our seasonals and two guest microbrews,” says Bob. “And here, you get a true pour. Our 16-ounce glass actually holds 18 ounces, the 8-ounce holds 10, and so on. There’s room for foam, so you get a true pour.” Custom brews out this week: vanilla cream ale, oatmeal stout and English red ale. Check on Facebook to see when new brews are ready. This entry was posted on Wednesday, June 27th, 2012 at 11:59 am	and is filed under Dining Guide. You can follow any responses to this entry through the RSS 2.0 feed. Both comments and pings are currently closed.